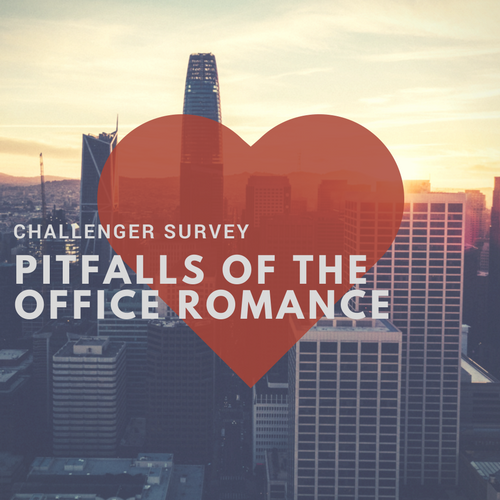 SURVEY: The State of Office Romances Post #MeToo | Page 3 | Challenger, Gray & Christmas, Inc. While office romances may seem inevitable – with one in four workers reporting they are currently or have engaged in a workplace relationship, according to the Society for Human Resource Management (SHRM) – they are often ripe for conflict, not only for the parties involved, but also for their employers. When these courtships are unsuccessful, they reportedly end in termination for at least one person 33 percent of the time, according to a survey conducted by global outplacement and executive coaching firm Challenger, Gray & Christmas, Inc.
“Many employers do not get involved in office relationships until something has gone wrong and the couple can no longer effectively work together. At that point, HR is left with limited options, most of which are unsatisfactory not only for the employee, but also for the company,” said Andrew Challenger, Vice President of Challenger, Gray & Christmas, Inc.
“Most options, including either engaging in litigation or firing or moving someone to another department, come with a considerable cost to the employer,” he added. Over 62 percent of HR executives said they have had to deal with a failed or inappropriate relationship at work. While one-third ended in at least one person’s separation from the company, another 17 percent of employers moved one party to a different department. Five percent of these failed relationships led to litigation, according to the Challenger survey. The survey was conducted among 150 HR executives in January. The respondents were from companies of various sizes and industries nationwide. Despite the potential for trouble, 27 percent of companies do not have any kind of policy, while 3 percent reported they do not care if their workers date one another. Another 10 percent inform employees that relationships are frowned upon. Nearly 70 percent of employers with policies do not allow relationships between a manager and a direct report, while 47 percent reported that they discourage manager/subordinate relationships, but do not interfere with relationships with workers from different departments. Thirty-three percent reported that they approach relationships on a case-by-case basis. Ten percent of companies do not get involved unless a problem arises. “Companies cannot and should not ban office romances altogether. Many successful relationships have begun at the office. This tactic usually leads to distrust in HR and an unwillingness to open up about relationships that could be potentially harmful or unethical,” said Challenger. “In the aftermath of the #MeToo movement, one task that falls to HR now more than ever is making sure that workplace relationships are safe and do not impact the overall culture of the office. Ensuring office romances are first and foremost consensual is extremely important,” he added. According to the Challenger survey, just over one-third of companies reevaluated their sexual harassment policies in the months since the myriad sexual misconduct allegations – many of which reportedly occurred in the workplace – were widely reported in the media. Of those, one in four companies updated or changed their policies, broadened training, and/or more effectively communicated their policies. Nearly 17 percent of companies said that they require those entering relationships to report it to the company. Another 7 percent said they allow any relationship, as long as it is reported to the company. One of the most common ways to make sure that the relationship is consensual and the company is free from liability is to implement “love contracts,” official documents outlining guidelines for all new relationships. “Real-life office romances are nowhere near as straightforward as they are portrayed on TV. The Office’s Jim and Pam are outliers in the actual workplace. Unequal power, unclear boundaries, bad breakups, and office politics all have potentially career-ending and life-altering consequences for employees, which is why HR policy addressing relationships is crucial in protecting everyone’s best interests,” said Challenger. “The best way to head off potential problems stemming from office romances is to create and communicate a policy with clear-cut guidelines for what employees need to do to communicate their relationships to their companies, and what will happen to their employment should the relationship end,” he added.